Keema is probably one of my favourite Indian “main course” dishes and so easy to cook at home. I used to think that ‘Keema’ was minced lamb but ‘Keema’ actually means ground/minced meat. 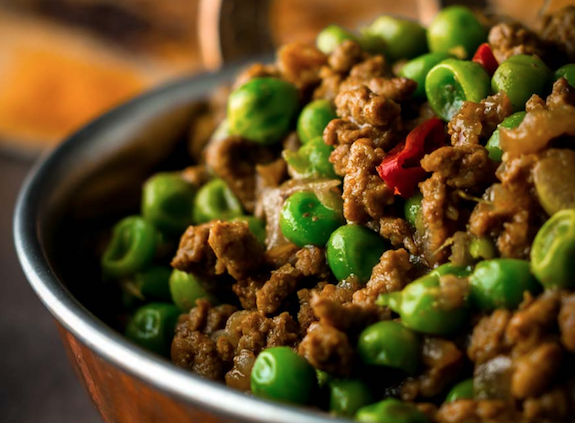 So when cooking a Keema you can literally use which ever meat you prefer…’Matar’ are simply peas. So, I’ve adapted this one after trying it at a recent curry club that I attended. Place the: oil, cardamon, cumin seeds, bay leaves, cinnamon stick, cloves and peppercorns in a large pan and heat through for a couple of minutes over medium heat. When the seeds start to split and burst remove all the ingredients from the oil and discard - leaving just the flavour infused oil in the pan. Next add the onion and gently from for around 5 minutes until softened - but not browned. Add the garlic, ginger and chillies and cook for a further minute. Now add all the dried spices, cook & stir for another minute. Add the meat of your choice, turn up the heat a little and brown the meat. TIP: Keep the meat moving and break up the meat as you go with a fork to make sure you don't have any lumps. Stir/fork/fry for about 15 minutes. Add the water and chopped tomatoes and stir through, cook for another 5 minutes or so and then add the peas and continue to cook on a medium/hi heat for 2 or 3 minutes. Finally add half fo the chopped coriander leaves (and stalks if you have them) - stir through and serve immediately. Garnish with the rest of the coriander.